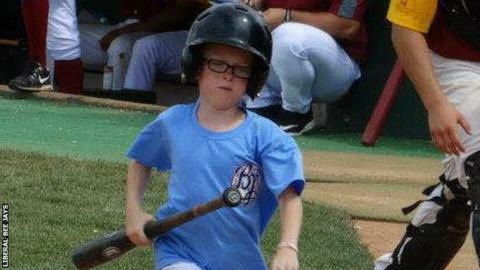 Kaiser Carlile was struck by a warm-up swing while acting as the Liberal Bee Jays' batboy - a youngster who carries and arranges equipment - on Saturday. Carlile, who was wearing a helmet, was taken away in an ambulance and his death was announced on Sunday. "With the permission of the family, and with much sorrow and a very broken heart, I regretfully inform everyone that Kaiser Carlile passed away earlier this evening," said club president Nathan McCaffrey. "Please keep his family and our team in your thoughts and prayers. Thank you all for the support during this ordeal." Mourners have posted messages of support on the team's Facebook page, with one contributor saying: "Prayers to the family and the player involved. My heart goes out to you all. May God help you find peace during this difficult time." The game, played as part of a summer league for college players, was completed, with the Bee Jays winning 12-5 in 13 innings.